Living It Up at Damansara Perdana. I recently did an interview with iProperty. Read all about it here. Talk of Damansara Perdana, and most people would associate it with its proximity to IKEA, the Curve and Tesco, shopping malls that many urbanites can’t do without. 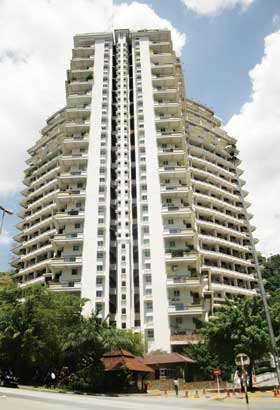 It’s also famous for its duplex condominiums, Armanee Terrace built by MK Land Holdings Berhad, the main developer and owner of most of the land in the area. No overview of Damansara Perdana is complete without mentioning MK Land and EMKAY’s founder, Tan Sri Datuk Hj Mustapha Kamal bin Hj Abu Bakar who is the driving force and the man responsible for the company’s success. Menara Mustapha Kamal, named after him is the headquarters for the group and is the landmark of Damansara Perdana. 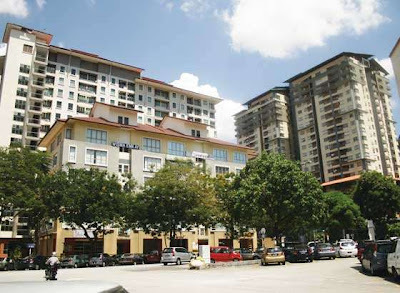 Damansara Perdana is essentially a 750-acre integrated township launched in 1996 as a premier centre for business and living in Petaling Jaya. It is part of the Golden Triangle of Petaling Jaya, and is considered one of the most exclusive suburbs in Petaling Jaya. 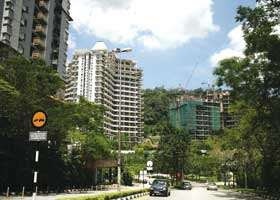 In its vicinity are other upscale neighbourhoods such as Mutiara Damansara, Taman Tun Dr Ismail, Bandar Utama, Damansara Utama and Damansara Jaya. It is also a short drive away from up-and-coming Kota Damansara. The hilly and undulating terrain is served by the Damansara-Puchong Expressway (LDP), the North Klang Valley Expressway (NKVE), and the Sprint Expressway. Due to its many obvious attractions, it is becoming a magnet for home owners and businesses looking for a convenient but upmarket location. A number of developers are also beating a path there, one of them being Crest Builder Holdings Bhd. We spoke to its youthful executive director, Eric Yong Shang Ming to find out his views on the popular area. iProperty.com: What new projects are you planning for Damansara Perdana this year? Eric Yong: We have a sizeable plot of commercial land in the area, of which we have plans for a RM300 mil GDV mixed development project. In the proposed development, we intend to have a mini retail complex, acting as a neighbourhood mall whereby it can serve the local population there who do not want to go too far (i.e. The Curve / TESCO etc). On top of this complex would be the podium car parks as well as the serviced apartments of various sizes. iP: What new transportation links eg. MRT, new highways are expected to pass by Damansara Perdana? EY: Based on the latest MRT (Blue Line)’s alignment, the line is expected to cut across Persiaran Surian, not too far away from Damansara Perdana. There will be feeder buses that will serve the area. However, this would take at least the next 4-5 years before seeing its completion and operations. Based on my observations, there is not much that can be done for road transportation as the highway structure (LDP – Penchala Link) is already very advanced. Internally, I would expect the routing and roads to be upgraded to allow for higher traffic. The current system – including the internal roads within Damansara Perdana, the U-turns and so on are quite congested already – and a re-routing needs to be done. iP: With the Rubber Research Institute (RRI) land in Sungai Buloh to be developed soon, how would this impact the Damansara Perdana area? EY: The RRI land is quite a distance from Damansara Perdana. I believe that the RRI development would directly affect the Kota Damansara and its immediate surroundings in a positive way in terms of capital appreciations and values. As for Damansara Perdana, it is unlikely that the RRI land would have any major effect as a new development would usually take time to mature and fetch ‘current prices’. The hot spot would still be at Damansara Perdana / Mutiara Damansara area due to its connectivity via the LDP. iP: What are your comments on complaints that Damansara Perdana is getting too crowded and congested with traffic jams? What steps could be taken to alleviate this? EY: As mentioned above, various steps need to be taken. Another major thing to do here is the enforcement by MBPJ (Majlis Bandaraya Petaling Jaya). I notice that the parking is quite a horrendous problem here whereby car owners park all over the place. MBPJ and the local police need to take sterner action against these owners.